You’ve seen the photos of green lights dancing around the night sky and want to view the northern lights yourself. The forecast predicts clear skies and high visibility. You need to get out of the city’s light pollution but need to plan where to go. Space.com explains the science behind the auroras natural wonder. Storms on the sun propel solar charged particles to the solar system. When the particle stream crosses Earth, Earth’s magnetic field and atmosphere react. The particles join with atoms and molecules causing the atoms to light up. Learn more about the science behind auroras here. Whether you plan a northern lights trip or chase the local forecast near you, you’ll need dark skies–the closer to the winter solstice the better. High latitudes, like Alaska, Norway, Iceland and Canada have the greatest chances since they are close to the Arctic circle. The lesser viewed aurora australis, or southern lights, appear in remote parts of Antarctica but can sometimes be seen from New Zealand and southern parts of South America. Tip: Focus on the destination first and northern lights second. Don’t plan an entire trip around seeing the northern lights. Weather is unpredictable and you may be disappointed. 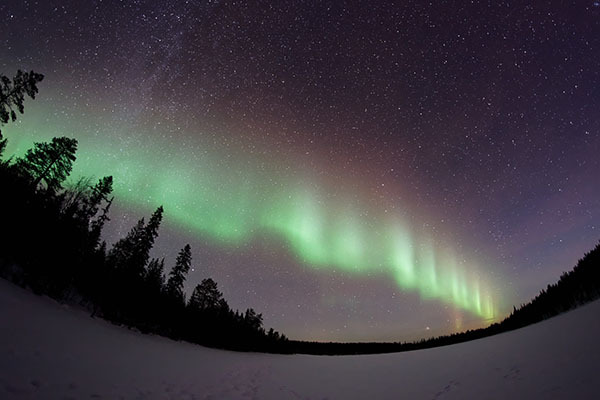 Similar to weather forecasts, apps (like My Aurora Forecast and Flowx Smart Weather) and websites (like NOAA.gov and Geophysical Institute) now provide forecasts on the aurora visibility and where the northern lights may appear. Combine the northern light forecasts with cloud coverage predictions to ensure the skies are visible during the light show. Check the moon cycle. Planning a trip during a full moon isn’t optimal. Snow is reflective and the moon will brighten up the surroundings, which makes it good for night landscape photography to expose the foreground but bad for sky photography. Don’t only look at the moon cycle but the rise and set times to know how to avoid the moon’s light pollution. Time to read a map and figure out the logistics after finding a weather window. Search the map for features where you’ll have a clear view of the northern horizon and are away from light pollution. Learn how to read a topo map to gain a better understanding of terrain. Make sure you understand the map features indicating ridgelines and valleys. Navigate out of valleys and find ridgelines or peaks for vantage points. Scan maps and overlays, including satellite views, to ensure trees and mountains won’t block the horizon. Seek alpine landscapes above the treeline to maximize line-of-sight. Try and find the date the satellite map was created to help understand how relevant the data. Use USFS Timber Harvest premium overlay to find forest lands harvested any time since the mid 1800s. Play with the overlay to find areas that may not have as much tree coverage to ensure you have clear views. The aurora forecast app notified you about a chance for the northern lights to be present near you. All your planning shows clear skies and new moon giving you a window to get outside. Not all hiking trails are equally the same. Some trails meander through forests without wide sweeping views or stay in valleys. Try finding a familiar trail that has clear views, it also helps with navigation since you’ll be hiking in the dark. Use Gaia GPS to search for public hikes near the area you want to go. Don’t follow the routes blind. Dig into the terrain more with the map layers mentioned above and below to ensure it is the right trail for the adventure. Being close to your car near a remote trailhead keeps you more flexible than hiking. Park for a view where the lights should appear and stay inside away from the brisk wind until a glimpse of activity on the horizon. The USFS MVUM premium overlay on Gaia GPS provides a starting point for finding the road less traveled. Consider turning off the dome lights and headlights to avoid damaging night vision. You’ll also make friends if you aren’t alone. You did your research and found the perfect location to sit back and enjoy the aurora lights. Unlike the long-exposure photos you see across the internet (and in this blog post), the lights may be hard to find if you don’t know what you’re looking for. At first you think your eyes are deceiving you until you realize that small glimmer of light on the horizon may actually be the northern lights. Still not sure? If you have a camera with long exposure and tripod, set it up to see if lights appear in the frame (it doesn’t have to be in focus to check). The sun set and the air is frigid. Unless you plan on doing a cardio workout and being continually on the move, you need to make sure to stay warm while in position to see the show. Bring big puffy jackets and long underwear. Ok, it may be a little extreme but staying warm will help you focus on the views and less about the atmosphere. Here are some tips on how to layer for winter hiking. Don’t forget that jumping jacks or cardio every so many minutes will keep the blood pumping and your body warm. While taking photos of the northern lights or staying still, consider bringing a form of insulation (cardboard or a sit pad) to either sit or stand on. Keep your feet warm with wool socks and insulated or waterproof boots. Mittens decrease dexterity but allow you to ball-up your fingers. Consider wearing liner gloves under an overmit. When you need to use your fingers, take off the overmits. Flights during off-season or winter months can be less expensive than visiting the destination in the summer. Same goes for hotels and rental cars. Set up alerts from your home airport to various northern light destinations and monitor flight deals to keep the costs down. Some airlines have provided package deals to include flights, hotel, and tours. Depending on your travel style, consider booking northern light specific tours in the evening. Tours allow you to optimize where you go and takes away from additional planning on where to go. Plus, you don’t have to worry about driving in winter conditions (icy or snowy roads). If you plan on booking a tour, consider finding accomodation close to the pick up location. Bonus if your tour picks you up at your hotel. Unlike vacations, a northern lights trip may not leave you feeling relaxed and rejuvenated. Don’t expect to get much sleep as you plan your evening events. If you’re located in the northern hemisphere, consider downloading a forecast app that will notify you when the aurora will be seen near you. Pair a forecast app with Gaia GPS to find the best place to view the lights. Oh, and don’t forget to download the maps offline before you go. Hey Buddy!, I found this information for you: "How to Find the Best Hikes for Viewing the Northern Lights". Here is the website link: https://blog.gaiagps.com/find-best-hikes-viewing-northern-lights/. Thank you.